A French geologist discovered this skull in the Afar Triangle of Ethiopia. It is the final proof that smoking is bad for your health. This man, in fact, was perfectly fine before lighting up his last cigarette. 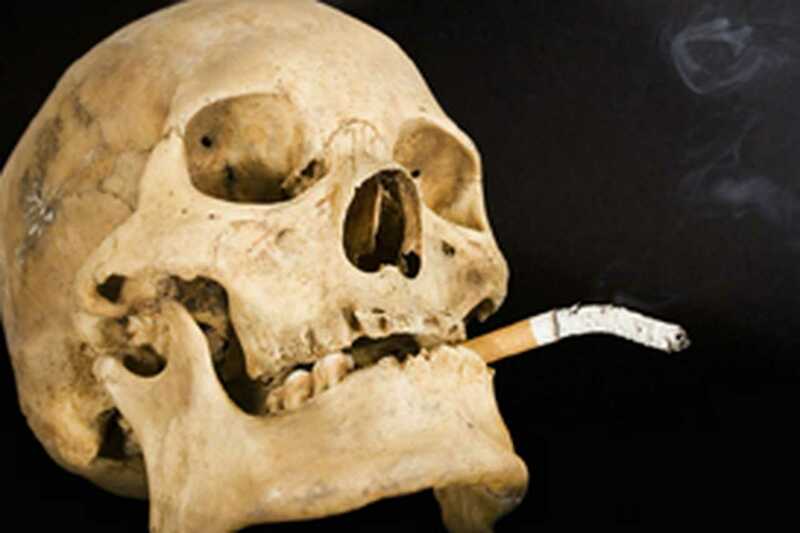 Beside jokes, I wanted to introduce the topic of smoking and periodontal disease. Smoking is risk factor for numerous health issues, such as: lung diseases, heart diseases, cerebrovascular diseases, but also periodontal disease and oral cancer. I thought it would have been interesting to start presenting some classic material from the American Academy of Periodontology. From the American Academy of Periodontology, link to Original Article. Surprising as it may sound, many smokers need to be made more aware of the dangers of tobacco use. In fact, just 29 percent of smokers say they believe themselves to be at an above-average risk for heart attack compared with their nonsmoking peers, according to a study published by the Journal of the American Medical Association in March of 1999. Obviously, while information about the medical problems associated with smoking – such as lung disease, cancer, heart disease and low-birth-weight infants – is widely available, many smokers seem to have tuned out. To increase awareness of the dangers of smoking, the American Cancer Society sponsors the Great American Smokeout every year in November. Americans are encouraged to quit smoking for a day or to encourage someone else to quite for a day. The idea is to help someone be smoke-free for a day in hopes of motivating that person to quit forever. In conjunction with the Great American Smokeout, the American Academy of Periodontology hopes to help educate the public about one specific threat to smokers – periodontal disease. Recent studies have shown that tobacco use may be one of the most significant risk factors in the development and progression of periodontal disease. In addition, following periodontal treatment or any type of oral surgery, the chemicals in tobacco can slow down the healing process and make the treatment results less predictable. In addition, research shows that current smokers don’t heal as well after periodontal treatment as former smokers or nonsmokers. But these effects are reversible if the smokers kick the habit before beginning treatment. is born to early and too small. Those bacteria generate the toxins to blame for gingivitis. but in addition make Diabetes worse. Understanding the effect that smoking has on your oral health seems like a very important point to make. It seems like there are more people who quit smoking after learning about the harmful effects that it has on overall physical health. Knowing how it also causes periodontal disease is also a great way to help people give up habits to have a better looking smile. In addition to causing periodontal disease, does smoking also affect patient’s from qualifying for certain dental procedures like dental implants? I understand that there are some cases when getting a bone graft for an implant is necessary. It seems like the bone and tooth loss that’s caused by smoking would also mean that a patient wouldn’t be able to get a bone graft. Yes, smoking reduces the percentages of success of dental implants and bone grafting.